This is my morning gratitude practice. Tonight I will add some art with a plain black ballpoint pen (the same one I journaled in the morning with). I start by doodling on top of my “free writing”. 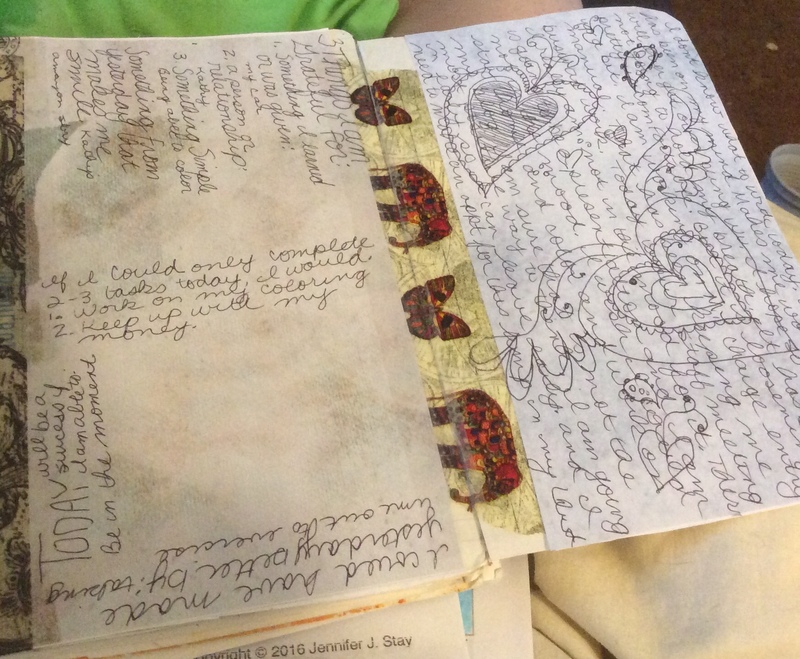 Then I fill in the blank spaces on my guided journaling. Now it is time to color. I love my Prisma colored pencils. I have so much to learn but I love the gorgeous color and shading!! I loved how the Winged Heart turned out. That was fun. And very relaxing. After my last post, I got sick. REALLY sick. I got the never ending flu. For weeks. I think I am finally getting over it but I am still stuffy. It was the kind of sick where I was completely wiped out. I was out from work and all I did was sleep. I was so exhausted I couldn't read or pretty much anything. The third round of medication finally kicked in late last week. So, no more coughing up a lung and my head is a lot clearer. What does that mean. 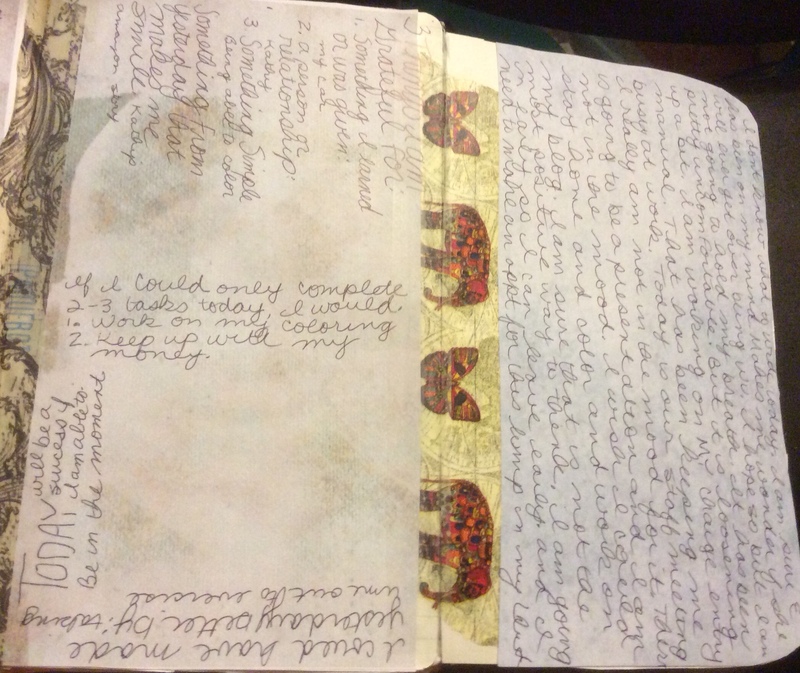 It means I finally got back to a regular journaling routine. 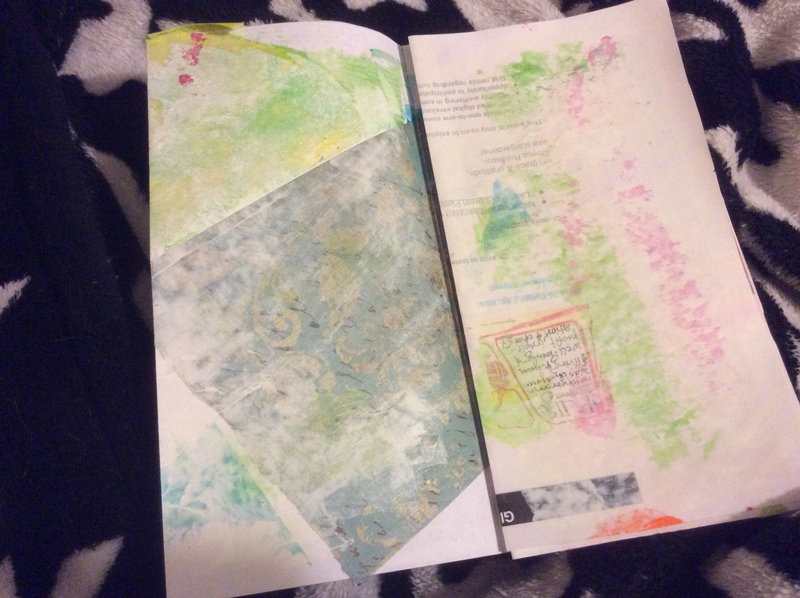 I am working in one of my older journals now that had remained unfinished. 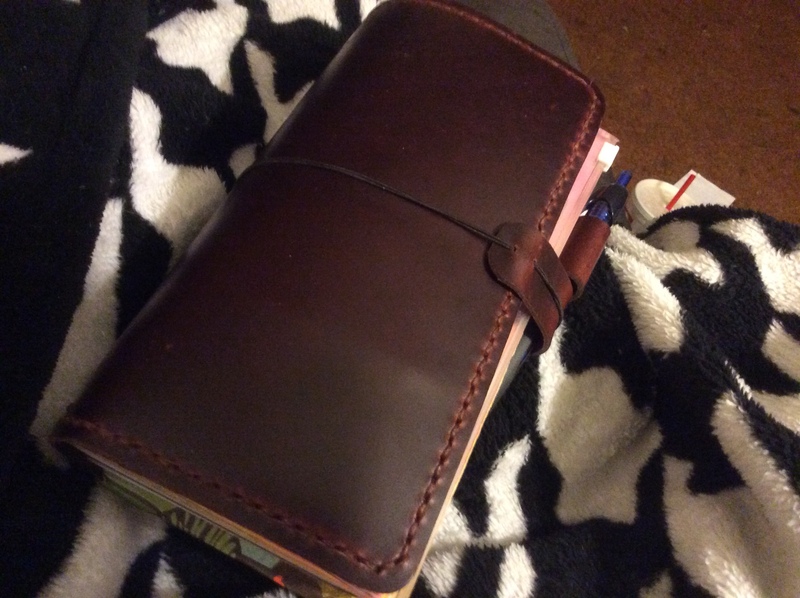 It is a smaller journal but has lots of cool stuff in the portion that is finished. It gives me a bit of incentive to get back to it. Even if just a bit. One of my new supplies… colored pencils. Actually, I never really liked colored pencils. I didn't like the “white” in between strokes. So for all these years, I have not wanted to use them. 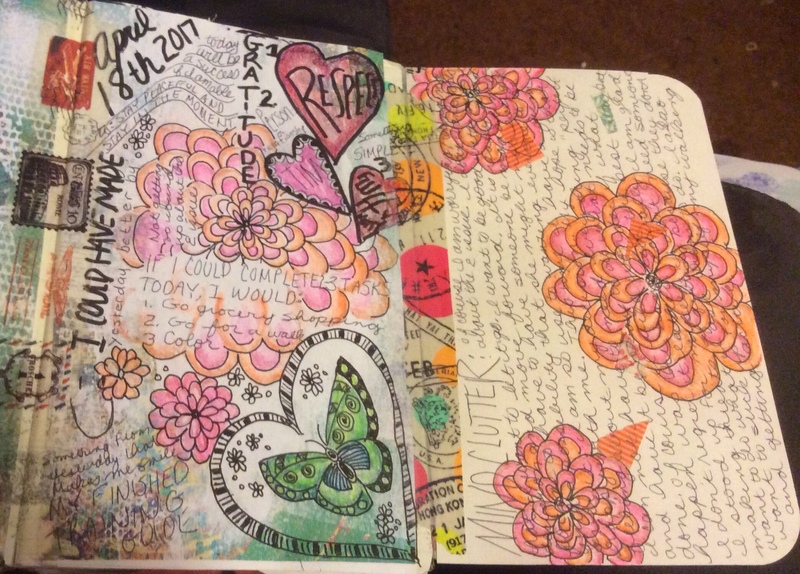 In my “new”, old journal, I wanted to have something simple to color my doodles. Kind of like an Adult coloring book of my own making. Markers don't really give shading… and you have to worry about them bleeding through the paper. Chameleon Markers could solve the shading issue but not the bleeding issues (besides they are expensive). So I searched through YouTube and found some Adult Coloring videos to get some ideas. I saw some beautiful work with colored pencils… and I decided to give them a try. I had some old Crayola pencils that had mainly remained unused so I tried them out. They were okay but didn't go down smoothly leaving some scratchy strokes. I saw the possibilities that colored pencils could have but wanted to find an option that gave a bit nicer result. So I got a pack of Prisma colored pencils. This is my first try. 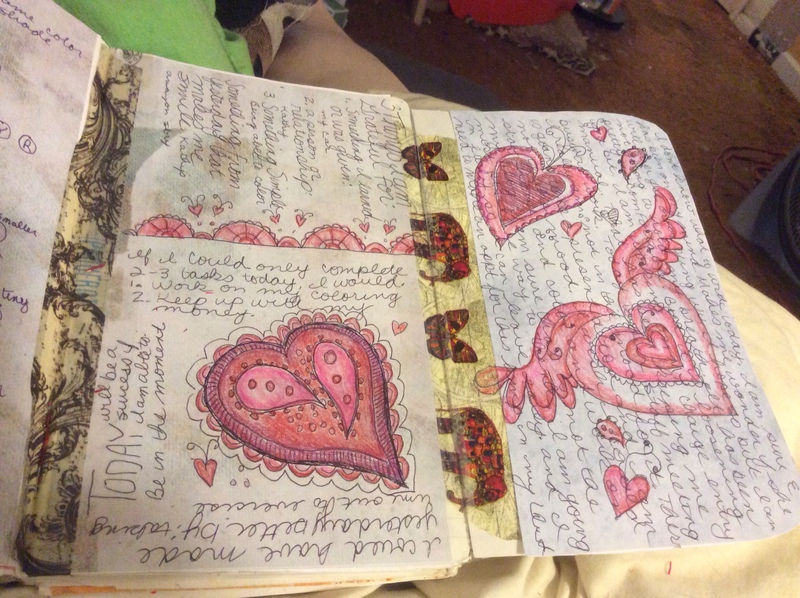 My journaling routine is to Write a Gratitude Practice in my journal in the am. 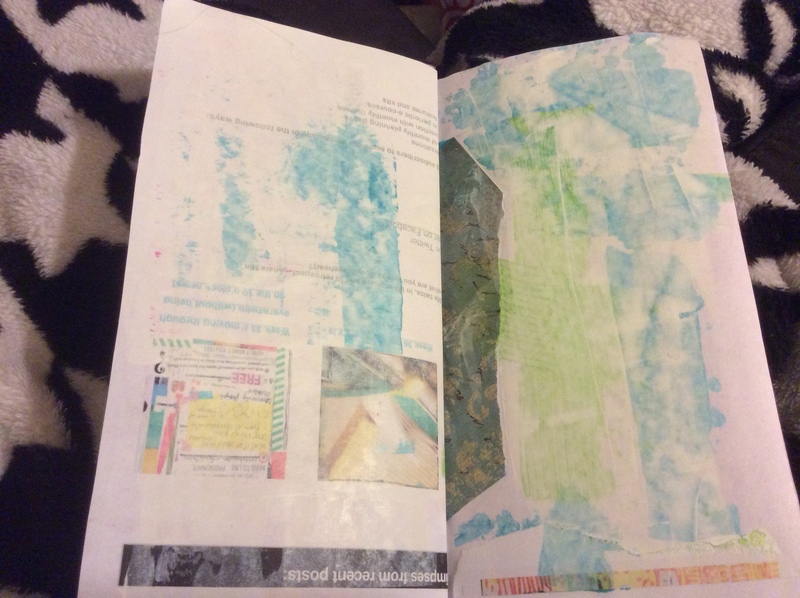 It includes answering a few prompts and then a page of free writing. 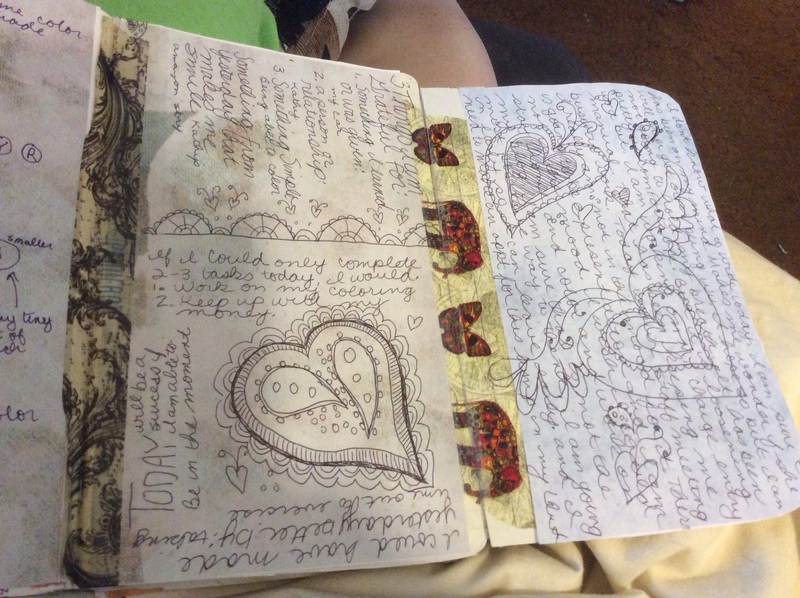 Then tonight I doodled in the empty spaces and on top of my free writing. I got to try my pencils and I have to say they are fantastic!!! I am not so good at shading but they did a wonderful job. The color went on easy and smoothly. I really love the results. Hopefully, tomorrow I can have more of a step by step. 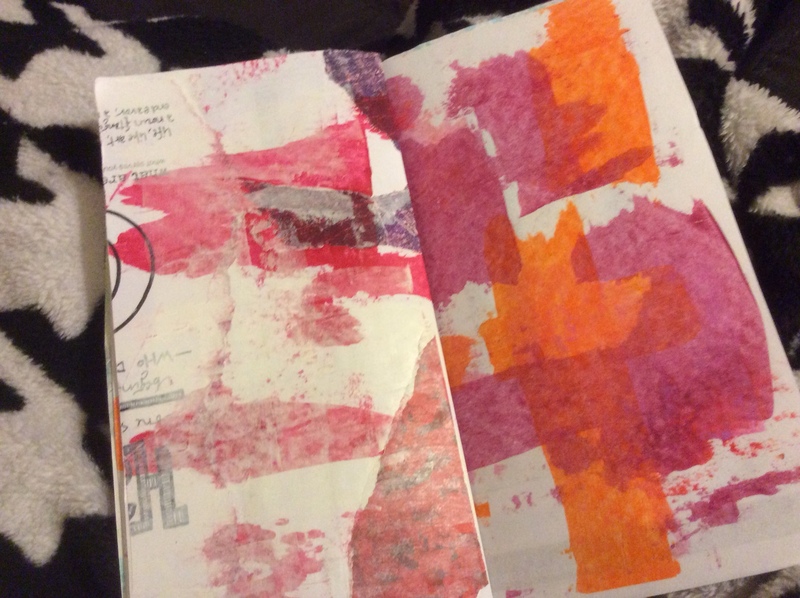 I have gotten back to Art Journaling. However, I also wanted to have something creative for my daily planner. 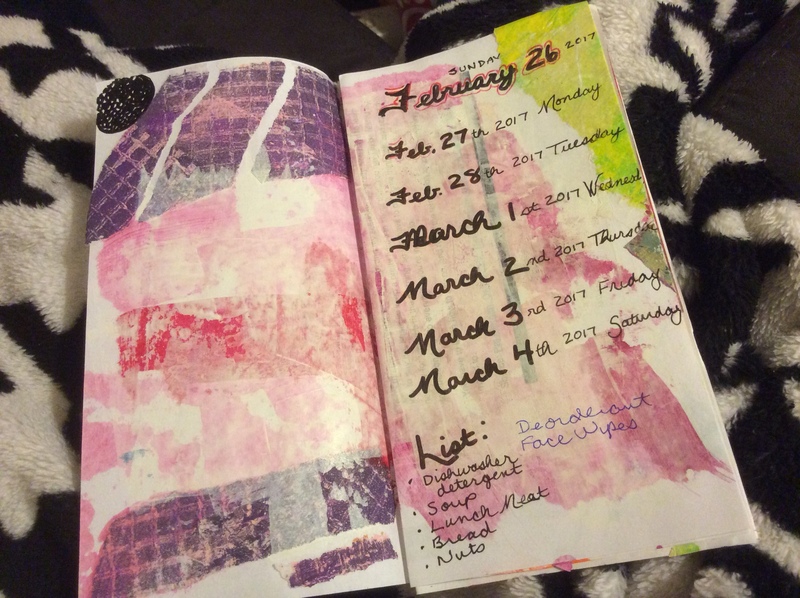 I have just gotten a beautiful Midori Travelers Journal and decided to make a Midori insert to use as a Planner. So I grabbed some old printouts (on regular copy paper – you know printed copies of website articles, calendars… junk). 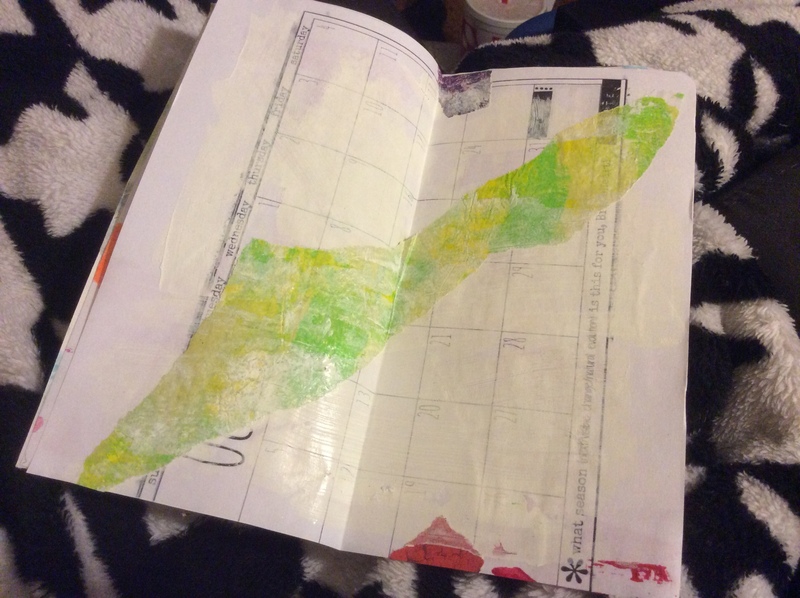 Then I glued on some scraps of painted papers, collage papers and scraped on some acrylic paint. Then I scrapped on a thin coat of white acrylic paint to tone down the color so that it would be easier to write on. A project that I thought would take an hour or so took way longer. 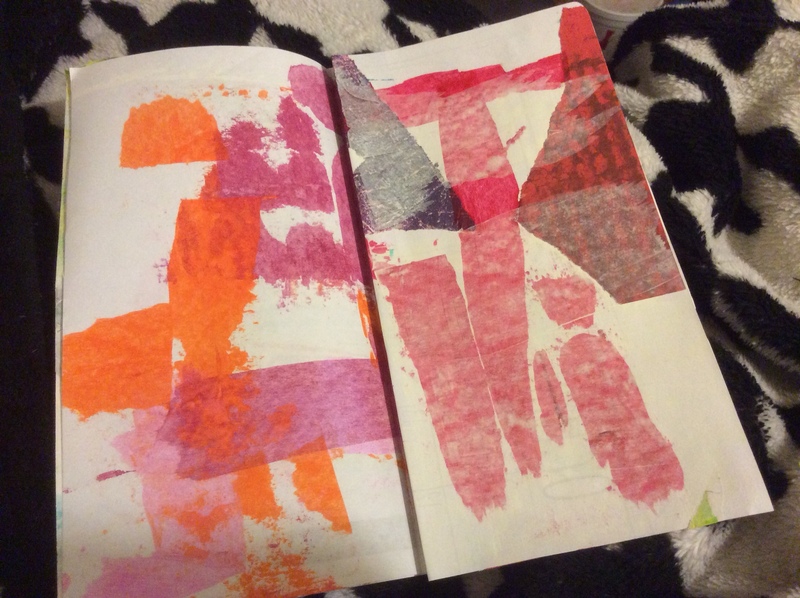 I liked how the pages came out. I just hated the insert once I started to use it… and I can't really tell you why. 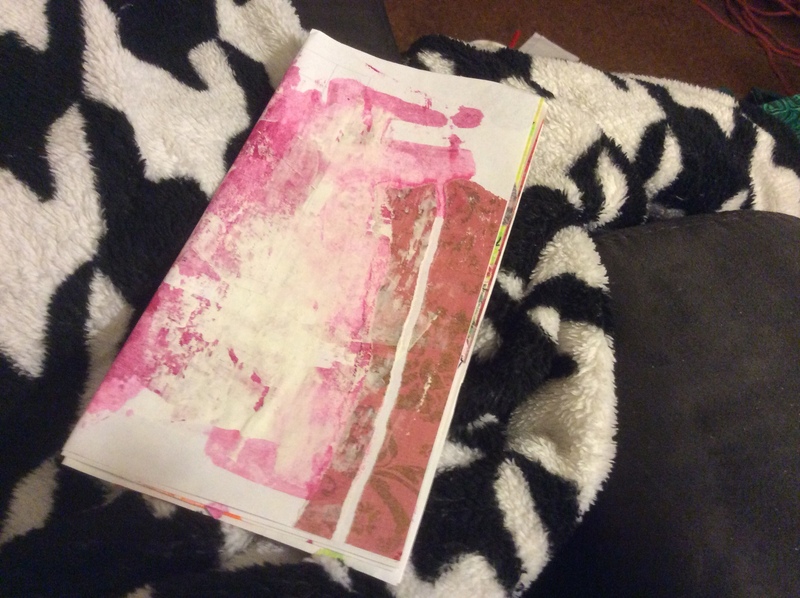 It is formatted similarly to other Journal/Planners I have made. I should have loved it. But no, I didn't at all like how my writing looked in it. And I couldn't think of a way to change things to make it work. Ick. So, what to do? I pulled out the 16 month Weekly Planner that I had gotten last August. It was one of those coloring planners. Coloring sounded good to me but doodling sounded even better. 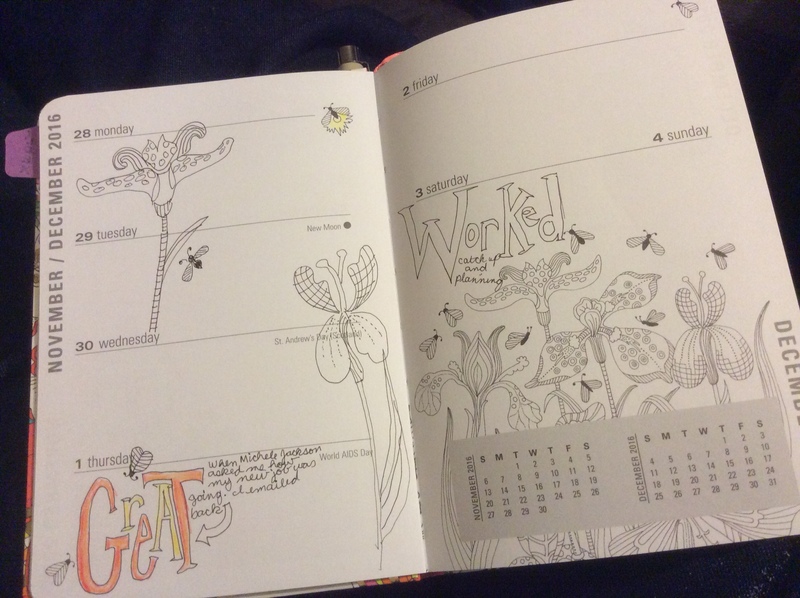 I can practice the doodles that are on the pages and also keep track of my daily schedule. 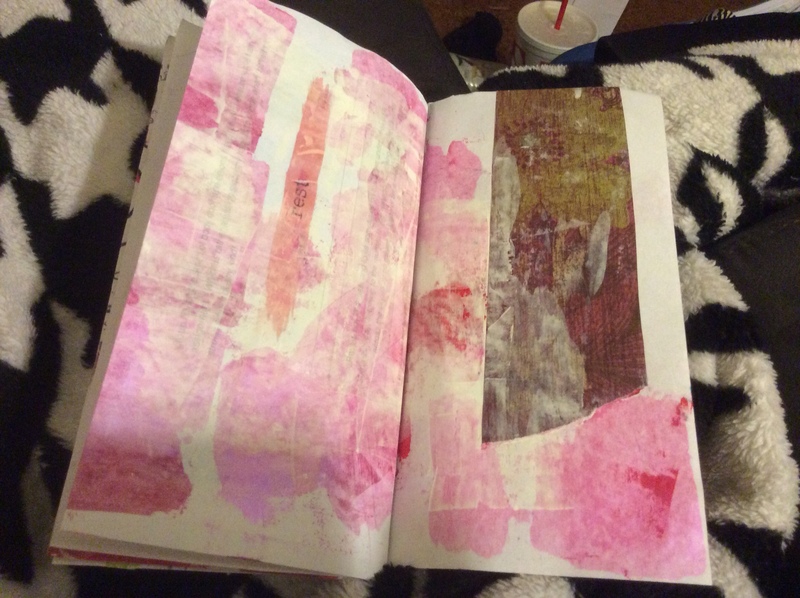 Then after the Planner is finished I can use it as an art journal. Sadly, I can't use it in my Midori. Still, it feels like the right choice. The flowers on the left are ones I doodled. I also added some of the bugs. I really would like to color with crayons but the doodles are too intricate. I might add color to the background once I have finished the week with crayon(because it is almost impossible to write with anything over crayon). I will give this a try and see how I like it. 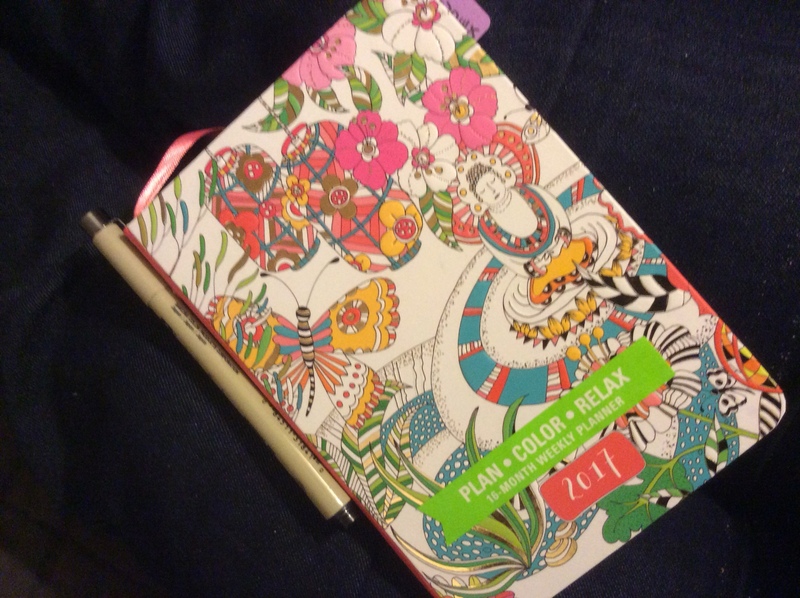 What do you use as a planner? Something creative?